Shabbat shalom, chaverim! It's been a busy week, and we're starring in our very own "Full Metal Nesting: The Sequel" show here at 20 Aliyah Street. The national strike ended, not with a bang but a whimper, late last week. Our lift got released from Customs on Monday. And after paying one more vig of about 800 NIS to cover port fees and an extra delivery charge for being on the third floor of a building with no elevator, we finally got our stuff on Tuesday afternoon. Goal! While waiting with baited breath, I took one last shot of the living room, in its never-to-be-seen-again, pristine state of minimalism. And then, the lift appeared, like a mythical beast incarnate, come to dwell among us. "Oh, Grandmother, what great boxes you have!" I will freely admit I would have been quite happy to have thrown several large sheets over the whole thing, and just walk around it for several months. But I knew my Eggies were in there somewhere, so I just had to get into those bad boys. Let the bubble wrap games begin! After about three days of non-stop work (after morning Ulpan and homework, of course), I can truthfully say that we're pretty much moved in. As I write, Elul is happily putting holes in the wall to hang up our pictures and clocks, and there's nothing that says "home" more than hanging up one's own personally handmade artwork. Specifically, I mean my classy and elegant "Time for A Poop!" bathroom clock! My grandfather always said, "you've got to be regular if you want to be happy." The older I get, the righter he was. We focused on getting the kitchen and our home office unpacked first. Unearthing a beautifully quilted toaster cover a dear friend made for me, I suddenly realized, "oh yeah...we don't have a toaster!" So out we went to a nearby home store, and got one. I didn't realize Hyundai made electronic toasters in addition to their line of sensible and reasonably priced cars. This toaster even beeps when your toast is done, such is the magic of modern innovation in toaster technology. However, the biggest kick I got out of this toaster was the packaging it came in, with its amusingly fractured English. You haven't had a perfect toaster experience until you've had one with "wariable electronic brown control" and a "sliding flexible tixed crumb tray easy clean." To celebrate our newly-acquired status of proud toaster owners (a sure mark of stability--just ask any social worker), I called a local veterinarian and put in our official request to adopt not one, but two, cats! We had already heard that this particular vet, who has an excellent reputation in town for his work with cats, would end up suggesting we adopt two so they could keep each other company as indoor cats. I've had two cats at a time many times in my life, so I was thrilled when Elul agreed to it, without the vet even having to ask us. As luck (or misfortune, actually) would have it, a couple of weeks ago someone dumped a mother cat and her litter of kittens outside the vet's door. He has been taking care of them, and his wife and daughter have been helping to socialize them when they've had the time to do so. We're hoping they will be ready for life inside a home. Now we need to source some "stay off!" spray to keep them from scratching our landlord's furniture, and a suitable scratching post, but other than that, we're ready for our new arrivals, Pini and Dudu Galoshes. Now, how in the heck are we going to get those cats home on our bicycles? Shabbat shalom, chaverim! And, as usual, if you can't see the pictures I'm talking about, go directly to my blog at www.movingtonahariya.blogspot.com . Shalom, chaverim! We are in the second day of what is predicted to be a four day stretch of rain, and when the forecasters say "rain," they really mean it! But neither rain nor snow (nor national strikes) will deter Elul and I from our appointed trudge to Ulpan, where we are intensively studying Hebrew. I say "trudge," but I'm just joking. Actually, we are having a blast going to school every day. Our teacher, Yael, is my age and looks like an Israeli Sheryl Crow. This makes it pleasant for the men in the class and inspiring for we ladies of "a certain age," so everyone's happy. She is also remarkable in that she speaks perfect Hebrew, excellent (at least to our ears) Russian, a fair amount of English, and, in her "spare time" learned Amharic, the language of Ethiopia. Although she is a self-described "potato couch," she does this all while raising three daughters and going to university one day a week. She has a terrific sense of humor, is extraordinarily patient with all of us, and is a wonderful teacher all in all. In fact, we are getting students from Acco joining our class, despite there being an Ulpan there already, simply because she is so good at her job. Our teacher Yael, not too happy because she's soaked from all the rain! "Ulpan Nahariya" is held in a combination of municipal building and city synagogue, about a ten-minute walk from our apartment. We don't yet have a permanent classroom, so we shuffle between three different rooms every week. Twice a week, we actually study in the synagogue, which is a bit daunting as we face three large portraits of individual esteemed rabbis staring down at us. And just so we get the point, there is a fourth painting as well, which features the three aforementioned rabbis posing together!I believe these rabbis, judging from their outfits and types of glasses, are not from the same periods of history. I often wonder, given our frequent collective bouts of bewilderment in the classroom, are they gazing at us in kind support, or in sad resignation? "I always feel like...somebody's watching me!" ﻿We meet from 8 a.m. to 12:30 p.m., Sunday through Thursday. There are about twenty people in the class: one from Canada, one from Mexico, three from the U.S. (including Elul and me), two from Ethiopia, and the rest from the former U.S.S.R. Those states include Russia (the dominant origin state of our classmates), Ukraine, Belarus, and Romania. We have a half-hour break at 9:30 a.m., and a fifteen-minute break at 11:30 a.m. During these breaks, most of the members of the class from the former U.S.S.R. generally grab a coffee from the vending machines and rush outdoors to spend the rest of the break smoking, talking and laughing. Elul and I are fortunate, though, in that one of these women does not drink coffee, but instead brings along a giant German thermos of tea every day. In exchange for our providing her with plenty of paper cups for all of us, we get each get a cup of tea. This really works for us, since my backpack "Big Student" is getting smaller by the day as we add more and more exercise books and dictionaries to it, so there's really no room for a thermos anyway. Speaking of the nutritional necessities of life, another member of the class is a brilliant painter from Romania who lives on a nearby moshav. Rodika has a job there, which I believe involves collecting eggs from the chickens they have on one of the farms. Last week, she asked the class if anyone was interested in buying fresh eggs from her, and Elul and I said we'd like to try some. We already had a dozen eggs at home, so we asked for half a dozen to try them out. She looked at us like we were crazy. "Six eggs?! What can you do with six eggs? I'll bring thirty!" We talked her down to twelve, so she promptly brought twenty in the trunk of her car the next day. I dropped one in the parking lot, so that left us with a plastic bag of nineteen eggs and a very careful walk home. Although the training season hasn't started yet, another interesting thing about this Ulpan is that there is a circus training school in front of one of the entrances. Given my unnatural contortions of Hebrew, and the mental gymnastics in which I engage at Ulpan, this seems quite fitting. I can't wait for their classes to begin, as there's a real trapeze out there, and a bike geared up so you can do a handstand on it! Cool! "Don't worry, it could be worse. You could be in there, studying Hebrew as an adult learner!" "And once you learn to do the handlebar handstand, you can recite the masculine, feminine, and neutral versions of numbers from one to ten." We laugh every day in class, mainly when our own mistakes make Yael laugh, and also at serious Hebrew words that sound like silly English words. For example, before we left for Israel, a friend who'd lived here years ago told us a story about being set up with her girlfriend on two blind dates with some local Israeli guys. They arrived at the house, and were introduced to our friend. One's name was "Peenie" and the other's name was "Doodoo"! Of course, "Pini" is a common nickname for Pinkhas, and "Dudu" is a nickname for David. The Israeli Prime Minister, Benjamin Netanyahu, in fact, is informally referred to here as "Bibi." So in honor of Israel, our love of third-grade humor, and the terrible weather we've had since we got here, then, we have decided to name our cat (that we will soon be getting) "Pini Dudu Galoshes!" Shabbat shalom, chaverim! And as usual, if you can't see the pictures I've posted on this site, go directly to my blog at www.movingtonahariya.blogspot.com. Shalom, chaverim! While Elul and I have been very busy not only settling in, but also now with Ulpan, we've also had time to just sit together and gaze out the window. As I've mentioned before, it's been fascinating to watch the cast of characters in our neighborhood go about their daily business. We're pretty sure now, for example, that the "blondini" (blonde) who lurks on the sidewalk in the early morning hours is, sadly, a druggie. On the other hand, we have fun watching the daily "What Not To Wear" transformation of "Camo Lady Dogwalker," who wears a camouflage bathrobe to walk her dog, then changes clothes and looks every bit the sharp-dressed woman when we see her later, leaving for work. Aside from people watching, we also enjoy paying close attention to the feathered residents of our neighborhood. Here's a little beauty I saw a few days ago while walking to the "Super Hof Ha'Dekel" (literally "Super Beach The Dekel") supermarket, "Dekel" being the name of the family who owns the store. Not a great shot, but it gives you an idea of how fast its wings are moving. By the way, here's a shot of the plant from which that hummingbird was sucking out nectar. I've scientifically dubbed it "Nahariyus Plantus Weirdus." Every time I pass this plant, I expect to spot one of those creepy egg-like things from "Invasion of the Body Snatchers"! These hummingbirds are larger than what we used to see in Nevada. Israeli hummingbirds are only slightly smaller than a swallow. African or European swallow? I don't know! Arghhh....! Here's a shot of a boring old pigeon I saw in the parking lot As an avid pigeon lover, I'm sure boxing champ Mike Tyson would disagree and find this bird fascinating, but me? Not so much. This pigeon is so boring that I can't even think of an amusing caption! 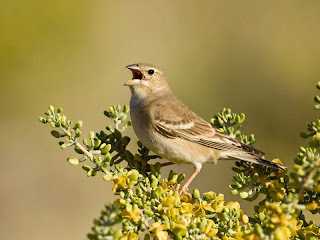 Another type of bird, called the "petronia," is featured in Yoav's picture below. 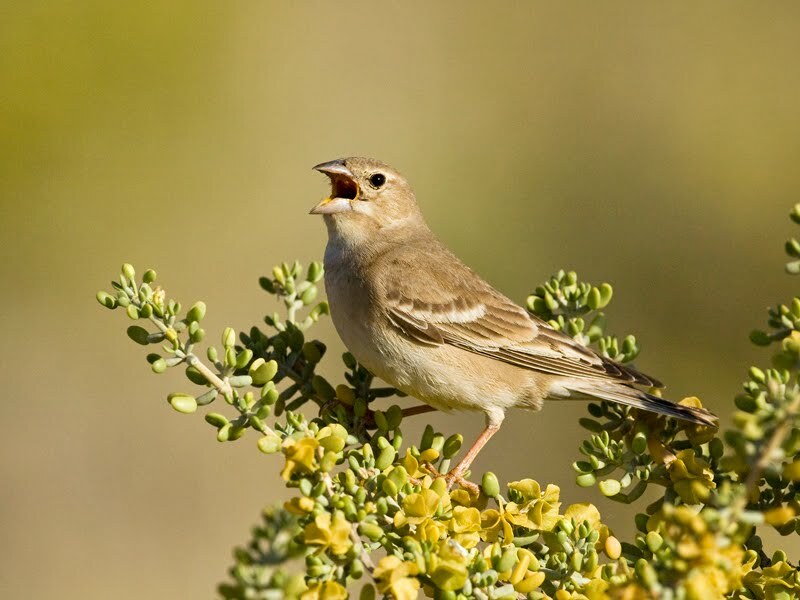 However, this bird is very rare and not found in this part of Israel at all. 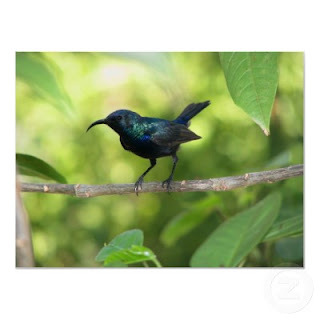 I put the picture in, though, because it looks very similar to the sparrow-type birds we see flying around our building. Our little birds are just a bit browner, and not so pretty. They particularly like to go into a hole in the wall left when our neighbors had their external air-conditioning unit removed! "Hey! Turn your fricking radio down, I can't hear myself cheep!" It's very entertaining to watch the local crows. They are quite good at gathering together and sounding the alarm when a person, a dog, or a cat comes near their territory, and make quite a racket until the interloper clears off. They also are very good at gathering things like bread, twigs, and nuts in their beaks and flying around with them, sometimes appearing to deliberately taunt other birds with their loot. The grey feathers on their backs make them look like they've draped grungy hoodie sweatshirts over their shoulders to keep warm, which is what we've been doing as well this winter. I can just see the headline now in "Women's Wear Daily": "Fashion Look 2013: Crow Chic Flies on Runway!" One of the Crow family. Maybe it's Russell, Sheryl, or Vel (geddit?!). 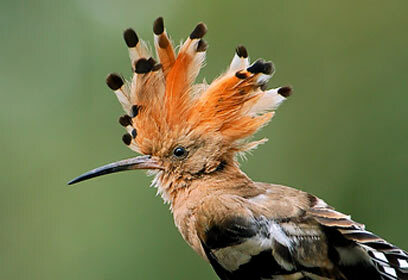 Dirty Hoopoe: "C'mon, punk...make my Shabbat shalom!" Lift Update: Our lift is still stuck on a ship in Haifa. We are now on day three of a national general strike, which means the all the banks, post offices, trains, ports, libraries, and municipal offices around the country, are all closed. And of course, then there will be another one or two days of closure because of Shabbat, which starts today. There is literally no one at the port to unload the ship, much less transfer our payment to the shipping agent (because the banks are closed), so we are in a holding pattern. 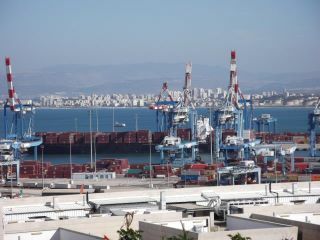 The shipping agent in Haifa told us it would take seven to fourteen business days to have our stuff delivered, but of course that timetable only begins when the strike ends. So we have a few more weeks of monotonous wardrobe and cooking choices ahead of us! Shabbat shalom, chaverim! And as usual, if you can't see the images mentioned in this blog post, go directly to the website at www.movingtonahariya.blogspot.com . P.S. I promised Yoav Perlman that I would send him the link to this post. I'm sure he will make corrections to what I am sure will be my numerous errors in identifying these birds!